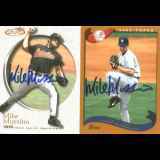 Michael Cole Mussina, nicknamed Moose, is a former Major League Baseball right-handed starting pitcher. Mussina played for the Baltimore Orioles and the New York Yankees. Mussina spent his entire career in the competitive and high-scoring American League East, won at least 11 games in 17 consecutive seasons ? an American League record ? and recorded a career .638 winning percentage. Among pitchers, he ranks 33rd in all-time wins, 33rd in games started, 66th in innings pitched, and 19th in strikeouts. A five-time All-Star and seven-time Gold Glove winner, Mussina's consistency resulted in six top-five finishes in the voting for his league's Cy Young Award. New Response (Success): sent an MLB baseball & $20 - received ball signed ..
New Response (Success): Received my baseball signed by Mike with #hof Sen..